Google is making great strides in the modularity movement with its customizable smartphone, Project Ara. But the search giant has but one man to thank for getting the tiled phone off the ground. Creating "a phone worth keeping" was a personal project for Helmond, Netherlands-based designer Dave Hakkens. His initiative, Phonebloks, shaped up as a smartphone with swappable components, but the original idea worked modules into washing machines, coffee makers and refrigerators too. "When I started this project, IoT [Internet of Things] was the focus. Everything will be connected, so my vision was that everything in your house would eventually be based on modules. I quickly realized that this was an enormous plan that felt too big, so I started to work on just the phone because not only is it smaller in scale, but it's something that we all use a lot." Hakkens quipped that his "big dream was a good starting point," but at the time, he had no clue that Phonebloks would be the start of an amazing journey alongside Google. The inspiration for the modularity project came from an unlikely source: a broken camera. The good news was his point-and-shoot was salvageable. The bad news? It would cost more to repair the camera than it would take just to buy a new one. This dilemma presents the crux of Hakkens' argument with Phonebloks: if tech products are built in such a way so that users could easily and affordably swap out components without any technical know-how, they'd be less likely to resort to tossing them in the garbage. Thus, the goal of Phonebloks was twofold: to paint a crystal-clear picture of the worsening state of electronic waste around the globe and to help get a modular smartphone to market. Based on modules, or "bloks" as Hakkens usually refers to them, the Phonebloks concept earns the slogan "a phone worth keeping" for a reason. Rather than being built into the phone, components like the camera and speaker are served up as individual, Lego-like modules that can be replaced should they break or if you want an upgrade. With this setup, you'll never have to throw your phone away when one part stops working. A good idea won't make it very far if no one hears about it. Fortunately for Hakkens, along with his small team, there was little trouble cooking up interest in Phonebloks. Their introductory YouTube video scored one million views in just under a day's time. Capitalizing on this viral success, a follow-up social media campaign gained another one million supporters. At this point, the tech world was abuzz and even writers at TechRadar got pretty excited. Companies also took notice of the initiative and were eager to meet with Hakkens and the rest of the Phonebloks team to discuss plans for bringing a modular smartphone to fruition. Of those that took interest, Phonebloks landed on Motorola as the right fit to make that happen. However, Hakkens was unaware that work was already well underway in Motorola's labs on a modular smartphone before Phonebloks even entered the picture. "They were working on something secretly in their labs," Hakkens told me "It was very much still in the brainstorming process, but it was something that they wanted to get started on immediately. Once they saw the splash that we made with the Phonebloks video, they realized that making a modular phone would be a bigger undertaking than it seemed at first." The fruits of the collaboration between the Phonebloks community and the brains at Motorola resulted in Project Ara, a vibrant, Android-powered prototype with modular architecture on full display. "From that point, it really became much more serious. It went public and things really started to accelerate," Hakkens said. "The people who were working on it saw that there was a need for this phone to exist. 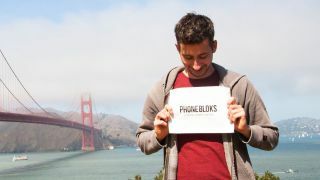 Phonebloks boosted their project from where they were to something much bigger."